Democratic presidential nominee Hillary Clinton speaks during the LGBT for Hillary Gala at Cipriani Club on Sept. 9, 2016, in New York City. "On Friday, offering remarks at a fundraiser in Manhattan, Hillary Clinton gave her view of Donald Trump’s supporters and caused a scandal by telling the truth," Jamelle Bouie wrote Sunday for Slate. His views were shared by a remarkable number of commentators of color — Ta-Nehisi Coates of the Atlantic, Jonathan Capehart of the Washington Post, Charles M. Blow of the New York Times, Bakari Sellers on CNN's "State of the Union," Juan Williams on "Fox News Sunday" and some white commentators. Jamelle Bouie was named a "Face the Nation" analyst last November. "Some members of the political press were swift with their judgment. 'No. 1 rule of presidential politics. Okay to mock your opponent. Never a good idea to mock the electorate,' said Michael Barbaro of the New York Times on Twitter. 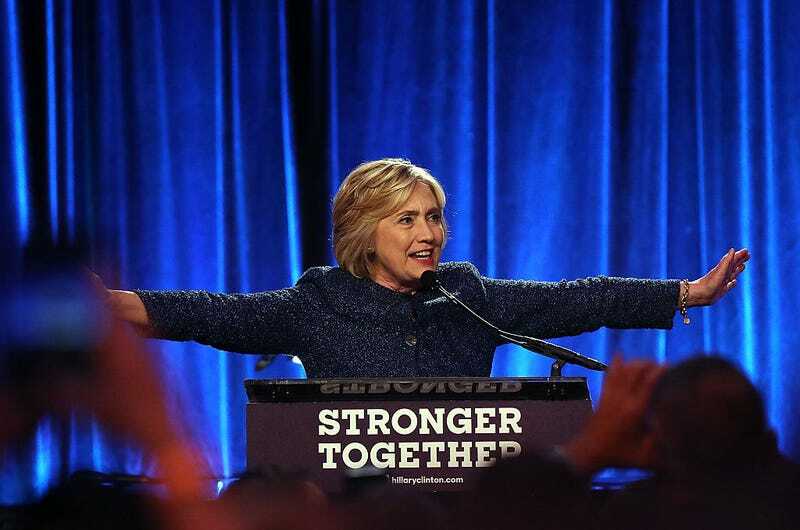 'Any more appropriate place for Clinton to make her "basket of deplorables" comment than at a fundraiser with Barbra Streisand?” asked Aaron Blake of the Washington Post.' Memo to candidates: Stop generalizing and psychoanalyzing your opponents’ supporters. It never works out well for you,' wrote Domenico Montanaro of NPR. "Most of this amounts to theater criticism — an analysis of how the remarks look, how they might play with a broader audience. In his take on Clinton’s riff, Montanaro at least begins to broach this question of whether any of it was true. 'There’s no data to support such a specific number,' he wrote, taking issue with Clinton’s view that 'half' of Trump’s supporters fall into a 'basket of deplorables.' And in her response to the criticism, Clinton walked back from that number. 'Last night I was ‘grossly generalistic,’ and that’s never a good idea. I regret saying 'half’ — that was wrong,' she said in a statement from the campaign. "But 'half' wasn’t wrong. 'Half' wasn’t a gross generalization at all. 'Half' was by all indications close to the truth. . . ."
He continued on "Face the Nation": "I’m inclined — so I’m inclined to see it as strategy and not so much as a gaffe because when I heard the remark, my first question was, well, is this true, right? Regardless of how it sounds or what it looks like, is it actually — what is the case about Donald Trump’s supporters? "And if you break down the numbers and you look at the Real Clear Politics average and that gives Trump about 43 percent of the registered voters. It was about 30, 31 million people. Compare that to polls that show 65 to 70 percent of all Republicans who say that Barack Obama either wasn’t born in the United States or is a Muslim. You look at pilot data from the American National Election Study and it shows upward of 40 percent of Republicans saying things like, blacks are more violent, blacks are lazier, Muslims are more violent, Muslims are lazier. "Among Trump supporters in particular, 60, 50, 70 percent of them agree with statements that political scientists categorize as being explicitly racist. So I’m — I’m looking at Clinton’s statement and half, which is about 31 million people again, doesn’t really seem that out of bounds. Forty to 50 percent of Republicans I would say, looking at the full spectrum of data, agree with beliefs that we would categorize as explicitly prejudiced. So regardless of whether or not Clinton needs [to] walk it back or not, I think she’s being correct and accurate. . . ."
"Since NBC’s Matt Lauer received widespread criticism for failing to fact-check Donald Trump at Wednesday night’s presidential forum, members of the public and press have been urging moderators for the upcoming debates to do better," Michael Calderone wrote Monday for the Huffington Post. "If the GOP nominee lies about being a vocal opponent of the Iraq War, as he did Wednesday and throughout the 2016 campaign, for instance, he should be called out. "Trump responded Monday to the Lauer controversy, and growing calls for the TV journalists steering the debates to challenge Trump’s and Hillary Clinton’s falsehoods, by proposing there should be no moderators at all. The Commission on Presidential Debates announced its most diverse slate of debate moderators on Sept. 1, including "NBC Nightly News” anchor Lester Holt, who is African American, to moderate the first of four presidential debates, and Elaine Quijano, a CBS News correspondent who is Asian American, to moderate the vice presidential matchup. Andrés Oppenheimer, Miami Herald: Fallout from Trump’s visit to Mexico: a rise of anti-Americanism? "A reporter from Democracy Now! who documented security personnel with guard dogs working for Dakota Access Pipeline is facing criminal trespassing charges in Morton County," N.D., Amy Dalrymple reported Saturday for Forum News Service. "Authorities have issued an arrest warrant for Amy Goodman of New York for a Class B misdemeanor, according to court documents. "Goodman, a reporter for the independent news program, can be seen on news footage from Sept. 3 documenting the clash between protesters and private security personnel with guard dogs and pepper spray at a Dakota Access construction site, including footage showing people with bite injuries, a dog with blood on its mouth and a dog attacking a horse. "The video footage has been widely cited by people who have since criticized the use of dogs by the security personnel, including the American Civil Liberties Union of North Dakota. The report also went viral online and was re-broadcast on many outlets. "Cynia Davis, 5, directed her mother to fill her slushie with equal parts red-, white- and blue-flavored ice Wednesday afternoon at Jimmy's Food and Deli," (scroll down) reads the caption on one of Brian Cassella's photographs for the Chicago Tribune. "She squeezed a lid on the frozen drink, stepping out with her grandma past a shattered glass door. Two groups exchanged gunfire Tuesday evening in front of the store at 35th and Prairie, wounding four people and killing bystander Christan Barlow, 52. "The intersection is in view of Chicago police headquarters two blocks west. A security guard and young customer were standing at the front when they heard shots.' A little girl got done getting her slushie or something,' clerk Kenneth Graham recalled. 'When he heard it, he moved her out of the way. She was about to open the door.' Bulletproof glass stopped the shot, leaving radial cracks." One by one on Monday, Cassella showed photographs and texts he's been writing for a Tribune series called "The Next Day," meant to show what happens the day after gun violence hits another piece of Chicago. Sometimes, he said, "people get to know their neighbors a little better. " His audience was the American Society of Newspaper Editors and the Associated Press Media Editors News Leadership Conference in Philadelphia. "Yesterday, these blocks were homicide scenes," his series begins. "The day after a fatal shooting, police tape is gone and residents live, work and play. More Chicagoans are shot and killed than there are days in the year, but there's a lot going on in our neighborhoods around the violence. Tribune photojournalist Brian Cassella explores the next day. . . ."
Cassella, 33, a seven-year Tribune employee, told the convention workshop that he had been to 250 homicide scenes in the last year and a half, often between other assignments. He is white and said people of color often assume he is a police officer, a reporter or a city worker. "Chicago's so segregated," he said. He added that colleagues told him that a young black man doing his job might be taken for another gang member. "It's better to stand out," he said. Jeremy Gorner, Peter Nickeas and Liam Ford reported Monday for the Tribune, "With the weekend toll of eight killed and 35 wounded, Chicago surpassed another dreaded milestone in a year that has seen the worst violence in two decades. As of early Monday, at least 3,028 people had been shot, more than the 2,980 for all of 2015, according to data collected by the Tribune. Last week, Chicago topped 500 homicides after tallying 481 all of last year, according to the Tribune data. . . ."
Cassella told the journalists, "I don't know how long the project can go on." Given the unabated violence, "It could go on forever." His photos are at http://www.chicagotribune.com/nextday. Also at the conference, Trif Alatzas, editor and publisher of the Baltimore Sun, accepted two awards for the Sun's coverage of last year's unrest after the death of Freddie Gray in police custody. As the Sun reported on March 25, ASNE announced that the Sun staff won the association's Breaking News Writing Award and Community Service Photojournalism Award. "Over the last decade, collecting DNA from people who are not charged with — or even suspected of — any particular crime has become an increasingly routine practice for police in smaller cities not only in Florida, but in Connecticut, Pennsylvania and North Carolina as well," Lauren Kirchner reported Monday for ProPublica. "While the largest cities typically operate public labs and feed DNA samples into the FBI’s national database, cities like Melbourne [Fla.] have assembled databases of their own, often in partnership with private labs that offer such fast, cheap testing that police can afford to amass DNA even to investigate minor crimes, from burglary to vandalism. "And to compile samples for comparison, some jurisdictions also have quietly begun asking people to turn over DNA voluntarily during traffic stops, or even during what amount to chance encounters with police. In Melbourne, riding a bike at night without two functioning lights can lead to DNA swab — even if the rider is a minor. . . ."
Shaun King, Daily News, New York: White men all over America continue to kill police — where’s the conservative outrage? "Fifteen years have passed since the planes hit the towers in New York," the Arab American News, based in Dearborn, Mich., editorialized on Thursday. "Beyond the immediate tragedy, the terrorist attacks on Sept. 11, 2001 gave birth to the disastrous 'war on terror.' A decade and a half and multiple wars later, the world is a far more dangerous place. "On the second anniversary of 9/11, the United States had been in Iraq for six months. Then, seven in 10 Americans falsely believed that deposed Iraqi President Saddam Hussein was personally involved in the attacks on the World Trade Center and the Pentagon. "Hussein was a secularist who was viewed as an enemy by al-Qaeda-type groups. As a matter of fact, Osama Bin Laden turned against the United States because he was not given a chance to fight Hussein after the Iraqi invasion of Kuwait in 1991. He thought the U.S.-led coalition in the first Gulf war violated the Holy Land of Hijaz by operating from Saudi Arabia. "As former Secretary of Treasury Paul O'Neil revealed in Ron Suskind's book 'The Price of Loyalty', George W. Bush was planning the Iraq invasion as early as February, 2001, seven months before the attacks. "Bush employed lies to turn 9/11 into a catalyst for his neoconservative aims. He used the tragedy to push his ideological agenda on the people of the world, setting in motion the violence and terrorism that would ravage the Middle East and target Western cities from Paris to Brussels to San Bernardino. "President Obama won a Nobel Peace Prize in his first year in office, but unfortunately, he followed in his predecessor's footsteps, albeit through different tactics. . . ."
The editorial concluded, "On the 15th anniversary of 9/11, our hearts go to the victims of the attacks, not only the thousands of innocent New Yorkers, but also the subsequent millions of atrocities of the War on Terror." Irving Washington, deputy director of the Online News Association, has been named to succeed Jane McDonnell as executive director, effective Jan. 1, the association announced on Monday. "In his current role, Irving serves as a key contributor to short- and long-term planning and strategy, responsible for operations and programming," the announcement said. "Since joining ONA in 2011, he has managed ONA’s highest-profile initiatives, including the $1M Challenge Fund for Innovation in Journalism Education, served as point person for all logistics for ONA’s annual conference and has grown the organization’s critical diversity and professional development programs. Juan Rodriguez, most recently assistant managing editor of the New York Post, has been named editor of the Monday paper, Chris O'Shea reported Friday for FishbowlNY. According to his LinkedIn profile, Rodriguez "managed paper's coverage of some of the biggest news stories in recent times, including the election and re-election of Barack Obama, the death of Osama Bin Laden and the Yankees' 27th World Series victory." Rodriguez joined the Post in 2000 as a business copy editor/designer and rose to assistant news editor, night editor and assistant managing editor. He was previously news editor at the Saratogian in Saratoga Springs, N.Y.
Howard University's School of Communications has received a public commitment from university President Wayne Frederick for a new building, school officials told a sold-out crowd of 370 who gathered Saturday night at Washington's Newseum to celebrate the school's 45th anniversary. National Urban League President Mark Morial and his wife, CBS News correspondent Michelle Miller, commemorating their 17th wedding anniversary, were masters of ceremonies. Alumni honored for their work in journalism, public relations and advertising spoke of their love for the school, echoing the words of public relations honoree Christopher Cathcart, who said that went he faced tough challenges, he told himself, "Hey, man, you went to Howard." Other honorees were D'Artagnan Bebel, Constance Cannon Frazier, Johnetta G. Davis and Fredricka Whitfield. "NBC’s comedy institution 'Saturday Night Live' has added some new faces to its roster for the 2016 season, including the show’s first Latina cast member ever," Lucia I. Suarez Sang reported Monday for Fox News Latino. "Comedian and impressionist Melissa Villaseñor was named to the long-running comedy skit show alongside Alex Moffat and Mikey Day, who has been a writer on the program since 2013. . . ."
Univision Communications Inc. and Fusion, in collaboration with the Bill and Melinda Gates Foundation, on Monday "announced their continued partnership and the launch of 'Camino al Éxito' (Path to Success), a year-long, multi-platform campaign that aims to help reduce the educational achievement gap among Hispanic students in the United States. 'Camino al Éxito' follows four Hispanic families over the course of an entire school year as they face important decisions on how to support, guide and advocate for their children. . . . ."
Jessica Doyle, a doctoral candidate at the School of City and Regional Planning at Georgia Tech is among those challenging a Boston Globe story Saturday about Norcross, Ga., where the story said white citizens are experiencing "a shift so rapid that many of the longtime residents feel utterly disconnected from the place where they raised their children." Doyle replied on medium.com, "Norcross, far from having the life sucked out of it by house-destroying, lottery-obsessed immigrants, is vibrant; and that vibrancy comes with challenges that everyone needs to address. At the very least, Mayor [Bucky] Johnson, the City Council, and other concerned citizens need to work on helping the newest residents feel like they can and must contribute to the city, and aren’t bringing about its downfall just by showing up while relatively poor and Spanish-speaking. . . ."
James E. Causey, editorial writer and columnist for the Milwaukee Journal Sentinel, asked readers Saturday to help him find his third-grade classmates. "If you can help me identify any members of this class from 1978, or if you went to Clemens or lived or worked in the neighborhood during that time, please contact me . . . ."